“For His anger is but for a moment, His favor is for life; Weeping may endure for a night, But joy comes in the morning. Now in my prosperity I said, “I shall never be moved.” Lord , by Your favor You have made my mountain stand strong; You hid Your face, and I was troubled. I cried out to You, O Lord ; And to the Lord I made supplication: “What profit is there in my blood, When I go down to the pit? Will the dust praise You? Will it declare Your truth? Hear, O Lord , and have mercy on me; Lord , be my helper!” You have turned for me my mourning into dancing; You have put off my sackcloth and clothed me with gladness, To the end that my glory may sing praise to You and not be silent. O Lord my God, I will give thanks to You forever”. (Psalms 30:5‭-‬12 NKJV). “The eyes of the Lord are on the righteous, And His ears are open to their cry. The face of the Lord is against those who do evil, To cut off the remembrance of them from the earth. The righteous cry out, and the Lord hears, And delivers them out of all their troubles. The Lord is near to those who have a broken heart, And saves such as have a contrite spirit. Many are the afflictions of the righteous, But the Lord delivers him out of them all. He guards all his bones; Not one of them is broken. Evil shall slay the wicked, And those who hate the righteous shall be condemned. The Lord redeems the soul of His servants, And none of those who trust in Him shall be condemned”. (Psalms 34:15‭-‬22 NKJV). “Thus says the Lord : “Refrain your voice from weeping, And your eyes from tears; For your work shall be rewarded, says the Lord , And they shall come back from the land of the enemy. There is hope in your future, says the Lord , That your children shall come back to their own border”. (Jeremiah 31:16‭-‬17 NKJV). “He will swallow up death forever, And the Lord God will wipe away tears from all faces; The rebuke of His people He will take away from all the earth; For the Lord has spoken”. (Isaiah 25:8 NKJV). 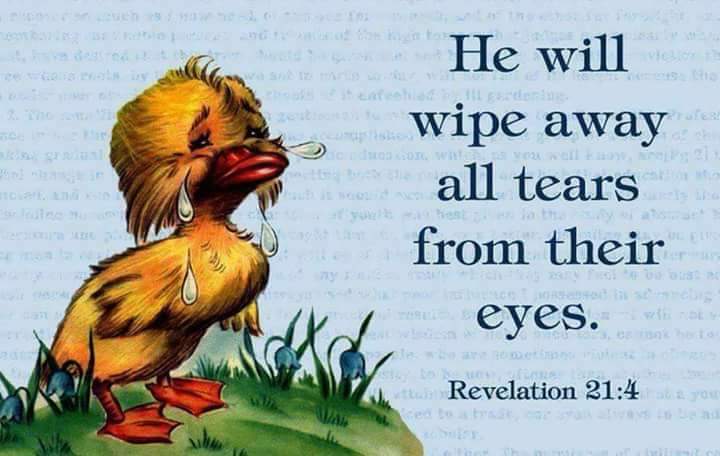 “And God will wipe away every tear from their eyes; there shall be no more death, nor sorrow, nor crying. There shall be no more pain, for the former things have passed away.” Then He who sat on the throne said, “Behold, I make all things new.” And He said to me, “Write, for these words are true and faithful.” And He said to me, “It is done! I am the Alpha and the Omega, the Beginning and the End. I will give of the fountain of the water of life freely to him who thirsts. He who overcomes shall inherit all things, and I will be his God and he shall be My son. But the cowardly, unbelieving, abominable, murderers, sexually immoral, sorcerers, idolaters, and all liars shall have their part in the lake which burns with fire and brimstone, which is the second death.”(Revelation 21:4‭-‬8 NKJV). This entry was posted in Daily Message and tagged tears of joy, your tears is just for a moment.